Product was easy to setup and use. User friendly and not to technically challenging for new users. Great customer service department if you enter any issues. Clean and simple interface, great customer service We’ve been using Freshsales for the past few months and it’s by far the easiest CRM we’ve worked with. A lot of other software is bulky and takes way to long to setup. We were up and running the first day with Freshsales. It’s so Intuitive that our sales staff doesn’t even need to be trained on it. If it doesn’t do what you want, just ask. Their team is great at responding to feedback. We’ve been using Freshsales for the past few months and it’s by far the easiest CRM we’ve worked with. A lot of other software is bulky and takes way to long to setup. We were up and running the first day with Freshsales. It’s so Intuitive that our sales staff doesn’t even need to be trained on it. If it doesn’t do what you want, just ask. Their team is great at responding to feedback. I am very happy with many of the features of Freshsales. Seamless integration with our googlemail and calendar, seamless integration with our ticket solution. Phone integration is the best I expirienced in my 20 year career (but most of the other also where pretty bad). Integration on the events from the website A list view of over 25 leads could easily been done via reports – still I would love to also have this option in the regular view – this is mainly an issue for an manager who tries to look into all the leads. Like mentioned it still works but could be easier. Easy for us to implement and good daily expirience. The whole sales team likes me more now (and that is no joke). So far the best I experienced on the market for non super complex use-cases. Seamless integration with our googlemail and calendar, seamless integration with our ticket solution. A list view of over 25 leads could easily been done via reports – still I would love to also have this option in the regular view – this is mainly an issue for an manager who tries to look into all the leads. Like mentioned it still works but could be easier. Easy for us to implement and good daily expirience. The whole sales team likes me more now (and that is no joke). So far the best I experienced on the market for non super complex use-cases. I wouldn’t say this product has the most features, but it offers everything your sales team needs to get to work for a more than competitive price. The email tracking, for instance, is really handy if you have team members sharing multiple accounts. I’ve seen other products offer similar features for much higher monthly rates, so you’re really getting a deal. I also like the user-friendly interface, which really helps when you’re trying to get your sales team onboard with using a new tool. It would be great if the software was a bit more customizable but if you have a traditional sales team with traditional sales needs then you should have no issues adapting to this product. I believe a 30 day trial is available for this product and I recommend trying it out. If you are trying to find a professional solution at a competitive price I think you will find that this product fits your needs. I wouldn’t say this product has the most features, but it offers everything your sales team needs to get to work for a more than competitive price. The email tracking, for instance, is really handy if you have team members sharing multiple accounts. I’ve seen other products offer similar features for much higher monthly rates, so you’re really getting a deal. I also like the user-friendly interface, which really helps when you’re trying to get your sales team onboard with using a new tool. It would be great if the software was a bit more customizable but if you have a traditional sales team with traditional sales needs then you should have no issues adapting to this product. I believe a 30 day trial is available for this product and I recommend trying it out. If you are trying to find a professional solution at a competitive price I think you will find that this product fits your needs. Freshsales is a sales-oriented CRM platform produced by the company behind Freshworks, the customer engagement platform. In 2012, burdened by a major vendor’s price for a CRM that had support for APIs, and using valuable developer resources simply to maintain their system of additional integrated platforms, Freshdesk built their own CRM with the built-in features their salespeople preferred. Freshdesk was founded in 2010 by current CEO Girish Mathrubootham in Chennai, India. Prices reflect monthly prices per user when billed month-to-month and when billed annually. Freshsales offers 24 x 7 email support, which can be reached via support@freshsales.io. They also offer 24 x 5 phone support for all plans. Their contact number in the US is +1 (866) 832-3090. Freshsales is geared towards high velocity sales teams – rather than a few big clients, these teams would have a large number of moderately-sized clients. With so much activity on different accounts, combined with the modern data needs and responsibilities of a salesperson, sales teams need a platform that combines multiple applications into one. The platform that’s easiest to use and saves users the most clicks per task wins out. 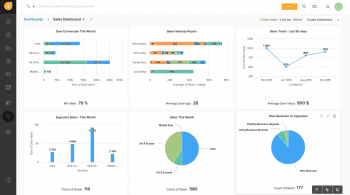 Towards this end, Freshsales is a competitive sales-oriented CRM – it’s got an open, straightforward UI, integrated phone and email, lead management, a deals pipeline, event tracking, a mobile app – all the features you’d expect for a sales CRM. The pricing is competitive; while users can get a barebones version of the platform for free up to ten users, the main functionality comes from email tracking, templates, notifications and Google calendar integration. 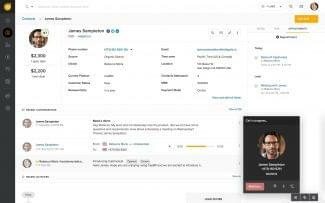 The ‘360 degree customer view’ presents comprehensive customer details in one place – their contact information, correspondence history, and sales history. The deals pipeline can be customized by stages and can automatically arrange leads by progress and allows manual arrangement through drag and dropping leads. Leads can be imported through CSV files, web forms or emails, but unfortunately, Freshsales does not automatically pull contacts in from Google, which is a handy feature of other CRMs like Insightly. Aside from the importation options, contacts can be added manually, but starting with the Garden plan users can enjoy Auto Profile Enrichment which draws information and photos automatically from social media. The Garden plan is Freshsales’ most popular plan. 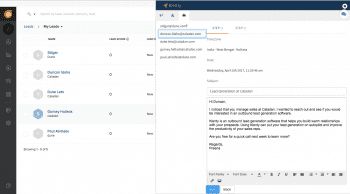 Users get the email tracking features with associated metrics, the email templates, the configurable lead assignment by size, industry and territory. It falls short of the in-app event tracking and website events tracking. Therefore the Garden plan seems best suited for sales teams selling services or a products without a need (or desire) for a highly nuanced online sales or marketing presence. Note that some CRMs with built-in phone features offer unlimited calling for certain plans; Freshsales does not. Users must pay $1 per phone line and then calling rates apply. In contrast, an even more heavily sales-oriented CRM such as Close.io – which was also developed as an internal solution for salespeople – is more expensive but allows unlimited calling with more automated features out of the box. Companies that spent a lot of time on the phone may prefer the predictable albeit higher fees of Close.io to those of Freshsales, which would fluctate depending on phone activity. On the other hand, Freshsales offers more ‘traditional’ CRM features than Close.io, and notably offers a mobile app, which Close does not. 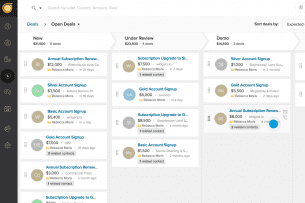 Freshsales integrates with Freshdesk, Segment, and Google Calendar. Zapier and access to the developer API can handle many other integrations. If sales is a major part of your business and you’re looking for a lightweight but fairly functional CRM, Freshsales offers nice functionality for the price. It’s not highly customizable, but it’s easy to setup, friendly on the eyes, and incorporates enough email functions – templates, scheduling, metrics, logging – for a nice balance between phone and email sales correspondence. They’ve got a 30-day free trial, no credit card required, which is more than most CRMs. If you’re in the market for a sales CRM solution, it’s worth giving a shot. What Do You Think of Freshsales?